What better way to celebrate a birthday or an occasion than to say it with cupcakes? 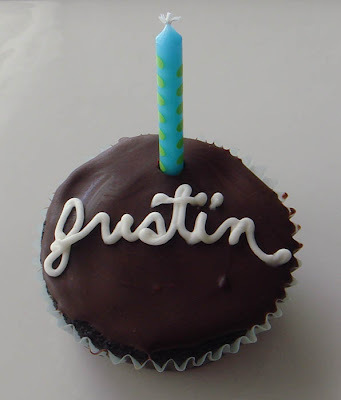 I wanted to make Justin something special for his birthday and I've always wanted to make a homemade chocolate cupcake with cream filling- like the classic Hostess cupcakes but better. But how could I put a birthday twist on it? 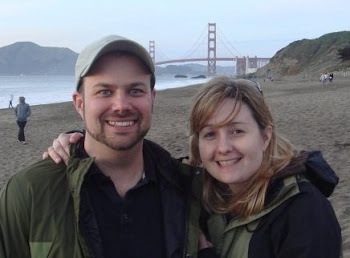 By writing out a heartfelt sentence about the birthday husband and dad-to-be! It was actually fun for Justin to then choose the appropriate cupcake for each guest based on the words- a fun little bonus! 1. First, here's the homemade Hostess recipe that I used from Bakeat350.blogspot.com. I completely agree with her that it's not an simple recipe but it is good. Plan to do some dishes because it requires four different components: the cupcake, the marshmallow cream filling, the chocolate ganache icing and the white icing. I do think it was worthwhile but I would make a few changes. 2. Make sure you have the right chocolate and consider some adjustments. The cupcake requires unsweetened chocolate, chopped and the ganache requires bittersweet. I didn't have enough of either. In the cupcakes, I used 3 oz of the unsweetened and I put in 1 oz of the bittersweet- it's what I had. For the ganache, I didn't have enough of my 72% bittersweet and I threw in about a third of some semi-sweet chips. I was glad I did because I found it to be a tad bitter. If repeated, I would use at least half semi-sweet chips. 3. Consider weighing your batter when you fill. Do your cupcakes turn out at different heights? Do you tend to overfill? I do. And I hate when I overfill cupcakes and the edges stick to the pan. So finally, I decided that I have had it and it was time to pull out my food science ways in the home kitchen. 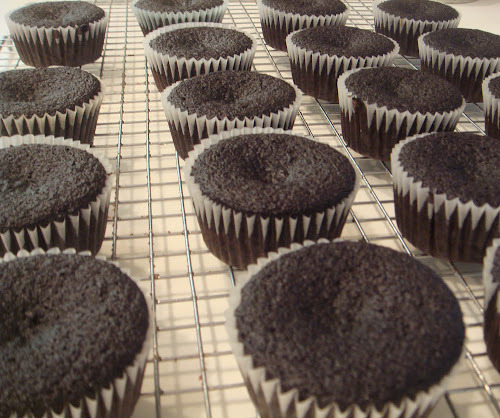 The recipe suggested about a 1/4 cup of batter to make 20 cupcakes. Rather than eyeballing it, I whipped out our scale and measured that a 1/4 cup of batter was about 44-46 grams. 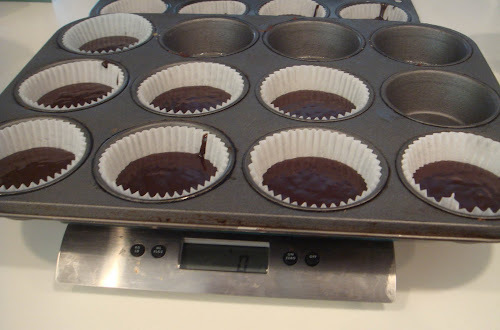 I then proceeded to measure out each cupcake (zero-ing the scale in between) to ensure that each fill would be the same and bake evenly. It yielded exactly 20 cupcakes and they were all the perfect height. 4. Set your timer for 20 minutes and check. The recipe said 25 minutes and I baked these at 22 but I felt they were still dry. I would set the timer for 20 and check with a toothpick. You'll notice that they are a bit sunken in the middle- which the original recipe said would happen. Since your are filling them, it's not a big deal and I always appreciate a heads-up on things like that. 5. 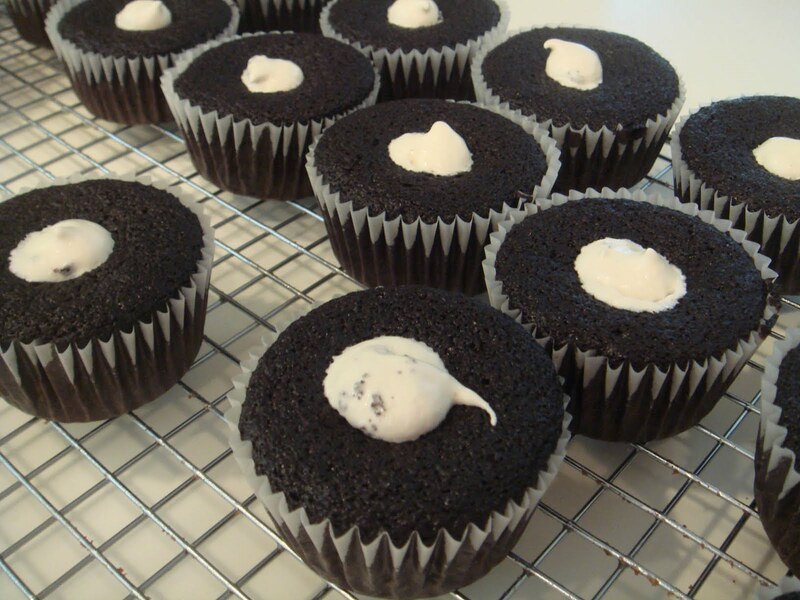 Try a sample fill and check the amount of cream filling before finishing all of the cupcakes. For the filling...the recipe suggested using a medium star tip and bag and to insert it into the cupcake and fill until it gets heavier. This didn't work out so well for me. The filling is made with marshmallow cream and it's pretty darn light. So I couldn't tell if I was getting enough cream inside. What I SHOULD have done was pipe one or two and then sacrifice it and see. What I did instead was pipe all 20 and then check. Oops. I was a little lighter on the cream than I intended. You can see that there is some cream on the top- that was actually no problem to cover up with the ganache. An alternative that my neighbor, Toni, suggested was to use an apple corer and take out a piece of the cake, fill and then replace. 6. Dollop and use the back of the spoon to spread the slightly warm ganache to get a smooth finish. At Toni's suggestion, I dolloped a decent amount of the ganache on top of the cream and then used the back of the spoon to spread. Somehow, this worked brilliantly and didn't visually mix in with the cream. The ganache needed to be sufficiently warm and runny to do this. When it started to cool, I briefly microwaved it for a few seconds and that did the trick. This will help to create a smooth finish. 7. Let the cupcakes chill before writing. This was also in the recipe and it worked well. I popped them in fridge for 15 minutes and that worked. I used a toothpick to help correct any mistakes or clarify the writing when it got too close together. 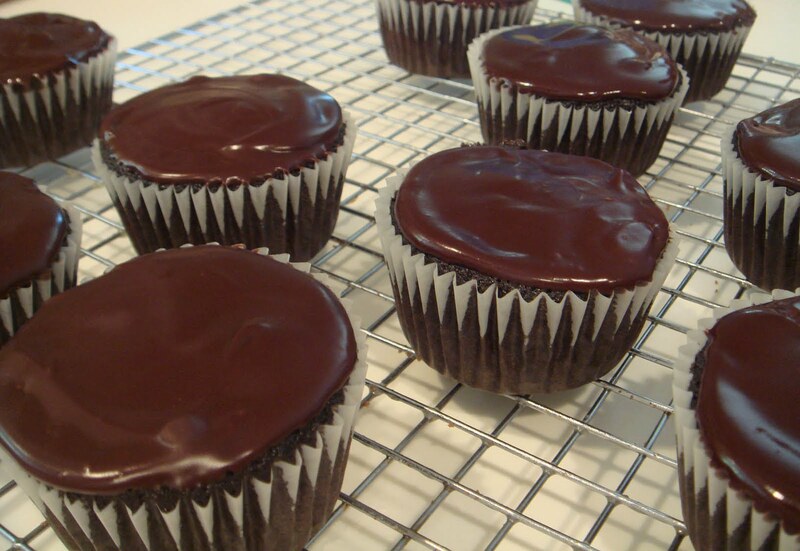 Because the chocolate ganache had hardened, you can correct mistakes. 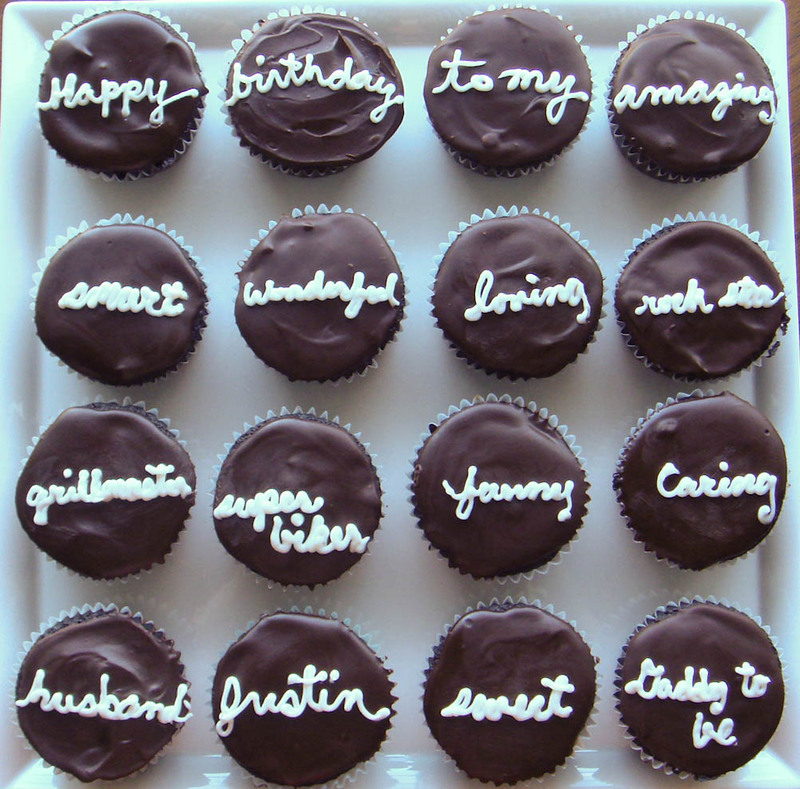 And so, there you have it... these cupcakes are delicious. 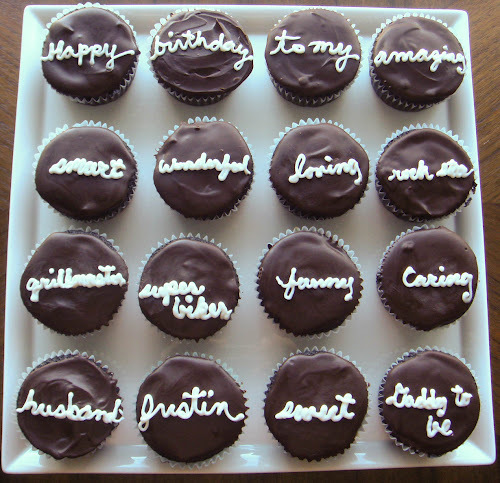 I know I learned quite a bit for my next round of filled cupcakes and hope to try making more some soon. I like the weighing idea! I just got a food scale too. I think I would try the apple corer for the center too. Hope they were delicious! They were. The weighing thing really works to get them all evenly filled and then baked. If you really wanted to be a superstar, you could weigh and bake a test one to make sure it is the right volume as well. 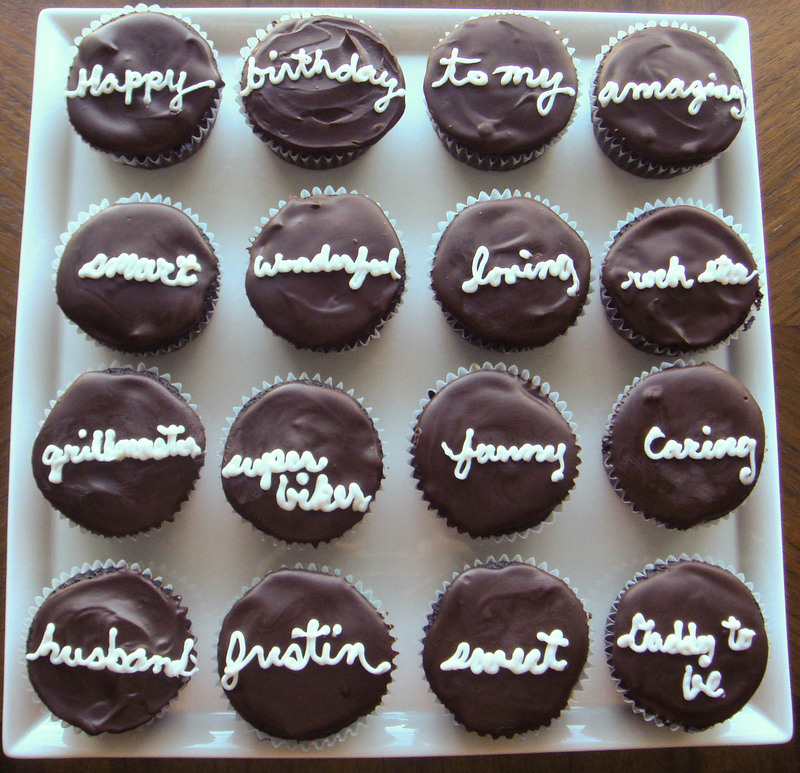 I just made the hostess cupcakes for my mom's bday (haven't had a chance to write about it, yet). I'm not a baker and this was rather ambitious for me, but they turned out great. I found that the cake was a little dry, too...until I put in the cream. The cake absorbed a lot of that moisture and gave it a great consistency. I used a medium star tip with pastry bag and it worked really well. My piping skills are no where near as good as yours, but I did manage to get one that said "KT." I had forgotten you did these, too! ooohh. Looks great, I'm trying this tonight!